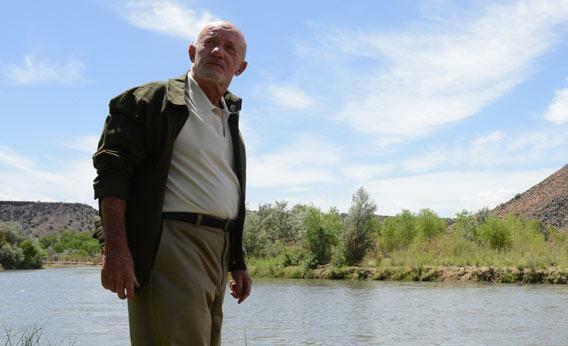 Breaking Bad episode guide: Is Hank the hero? Will Hank be the hero of Breaking Bad? Like the rest of you, I’m extremely skeptical of Walt’s relationship with Todd. I loved the montage of them cooking. Walt is a wonderful teacher, encouraging even: “You did fine Todd, you applied yourself, that’s as much as I can ask.” But, just as the Scarface reference in Episode 3 seems a handy foreshadowing of Walt’s eventual fate (speaking of which, what was the movie Mike was smugly watching when the DEA raided his house? ), The Monkees’ misleadingly upbeat “Goin’ Down” surely offers us some clues to the future of this relationship. “And it’s so hard to stay afloat/ I’m soakin’ wet without a boat.” Walt is floating along at this point, clearly desperate for some human interaction—someone who looks up to him and respects him. Todd can’t judge Walt because he never knew him before. Walt was always Heisenberg to Todd. This recognition, as you mentioned, Matt, is all Walt has left. But to answer your question more directly, no, it doesn’t seem like Walt has a plan, at least not a good one. This episode’s opening scene, which as Matt suggested might be the beginning (if not the middle) of Walt’s downfall, was the first time I really doubted one of his plans. Before last night, even if I wasn’t on his side, I always felt confident that Walt would figure everything out, but this plan seemed kind of, well, half-baked. What exactly is he proposing, and are they really scared of him just because he killed Gus? It’s still not clear to me why Declan would even go along with it; after all, if he just killed Walt, he’d be the guy who killed the guy who killed Gus. (Not to mention he’d eliminate his biggest competition.) But maybe that’s just me thinking a little too much like Walt, not keeping in mind the repercussions. Let’s not forget Jesse, though. Walt’s promise from last week clearly didn’t go as planned—everyone didn’t win. With Mike dead, where does that leave Jesse? I was glad to see him walk away when Walt got all high and mighty about the “blood money.” The earlier shot of Walter closing the garage door on Jesse and Mike made me (naively) hope that he was done with them—but now that Mike’s dead, I’m eager to see how Jesse reacts. Will he come back? Will he be the one to finally turn on Walt? Speaking of Mike, our legal expert Emily is not here, but I’d love for someone to explain this to me: Is Mike Dan’s client, and if so, can a lawyer flip on a client like that? I don’t watch as many procedurals as you, Matt, but isn’t that illegal? At the very least, doesn’t it defeat the purpose of attorney-client privilege? I’m not exactly sure how this works, but it seems strange to me that Mike would leave himself vulnerable like that when he’s so careful about paying off everyone else—though I will admit I loved Gomez’s confident grin when Dan got caught. Which reminds me, is anyone else skeptical of Walt’s excellent timing? It felt a little absurd to me that Walt would be in the office at the exact moment that Gomez told Hank that Dan would flip on Mike. It reminded me of the Arrested Development gag mocking TV shows in which characters turn on the TV and the segment they were discussing just happens to be playing exactly at that moment. Emily Nussbaum wrote a fabulous piece in last week’s New Yorker making the suggestion that Breaking Bad might be “a hero’s tale in disguise,” a story in which Hank is really the hero and the series ends with some relief for the “suffering audience.” As much as I rooted for Walt to outsmart Hank in the show’s first few seasons, this episode reminded me that Hank is actually a great detective (even if he can’t see what’s right in front of him). But having the series end with Hank virtuous and victorious doesn’t sound like Breaking Bad at all. I suspect that Hank will have to compromise himself in this pursuit. After all, that scolding he got about spending too much time and effort trailing Mike screamed illegal wiretap. Or maybe now I’m just confusing this show with The Wire.